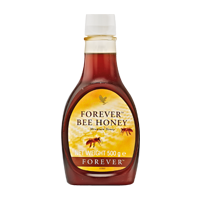 Not all honey is made equal and Forever Bee Honey remains one of our most popular products thanks to a pure taste that captures nutrition direct from the hive. This all-natural, delicious sweetener is naturally nutritious and perfect for replacing processed sugar in your diet. Thanks to its easy-pour bottle, this honey leaves no sticky mess and can easily be poured into porridge, stirred into Aloe Blossom Herbal Tea or used in cooking. Consider it a gift from our bees to you! Can be eaten alone or as a natural food sweetener. Not suitable for children under 12 months. Store at room temperature. Crystallisation may occur if stored incorrectly. If this happens, place the container in warm water.